I have plenty of screen real estate and even though my hardware is powerful enough to not give me the spinning beach ball all the time, for some reason, I still feel awkward when I have many applications running simultaneously on my twin-displays. There are of course applications I want to be there at hand all the time. For instance, I don’t want to start and quit Mail and Skype a dozen times a day. I have also started relying on iCal more seriously to satisfy my calendar needs: another potential addition to the group of ever-open applications. And it is not simply about the one extra open app. I must tell you, I am not comfortable having to click over to the iCal window and then perform a combination of click’n’types just to add an event or reminder (todo) to one of my calendars. After all, this is not something I have to do very often (maybe 1-3 times a day), so why should I keep iCal open? And in case it is not running already, why should I start it just to add an event or reminder? I have found a solution to tidy up my workspace and it seems to be working fine for me. Unfortunately, it is not a hidden iCal feature I discovered, but extra software to be installed. It is called QuickCal and it allows you to add events to your iCal calendars even when iCal is not running. 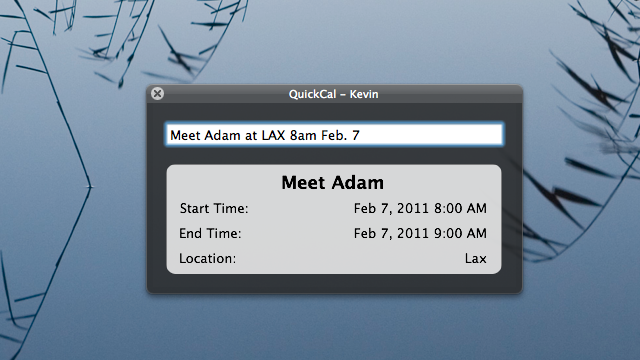 What is really neat about QuickCal is that you can add items to calendars using natural, everyday language. No need for a series of clicks. You simply trigger QuickCal’s pop up window with the hotkeys and start typing the info right into the QuickCal pop-up window. It parses your text for date/time info immediately and creates an iCal event. You do not even have to worry about exact dates. So for instance, you have a deadline next Saturday. You type ‘deadline next Saturday’ and QuickCal figures out what date ‘next Saturday’ refers to. (I guess Siri does the verbal equivalent of this, but I don’t have an iPhone). The good news is that QuickCal runs in the background (it is more like a widget), which means you can set it to be loaded automatically at system startup and reside on your OS X taskbar, the window only pops up when needed. That is one alternative way of imputing events and reminders. On the other hand, you may want to be able to have quick glimpses at your upcoming events without launching and keeping iCal open. 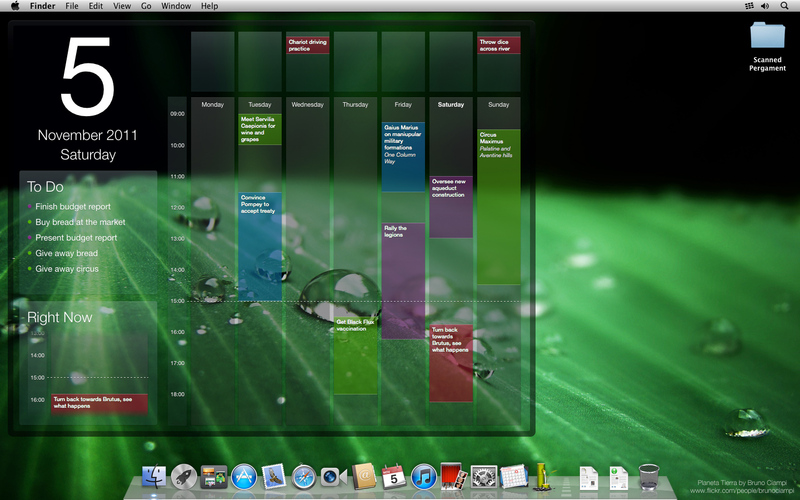 There is a witty solution for that, too: you can display calendar information as a layer on your desktop background. There are a number of applications to choose from. The one that I am most familiar with is iCalViewer (now, TimeWorks). It offers a graphic representation of upcoming events as ‘boxes’ floating toward a ‘finish line’ representing today. A key feature is that you can set how far ahead you want to see in your calendar: a week, two weeks or oven more. 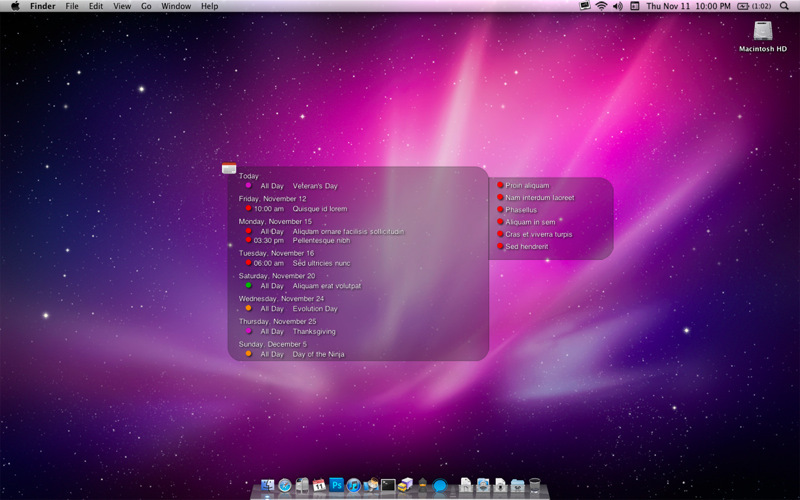 Another option is Blotter, which display events and todos just like iCal does. However, it has a serious limitation. It only has a weekly display mode, so you can’t see more than the next 7 days. On the positive side, the graphics and layout are easy on the eyes, being nicely minimalistic. 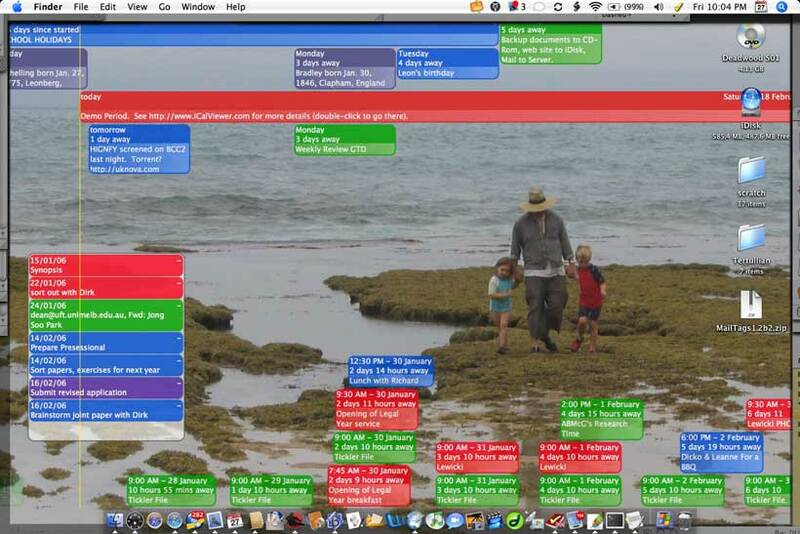 Also, Blotter supports multiple displays, so you can choose on which display you want your calendars shown. The third alternative you may want to explore is iDeskCal. As opposed to the other two applications, this app displays calendar information as text. For those people who do not want to cram a whole calendar onto their desktop (which may already carry loads of file icons), this may be a good choice. The above apps can display info from BusyCal, Things, or OmniFocus, you just need to set them up to sync with iCal. I graduated from CEU with a Ph.D. in Environmental Science and Policy. I taught undergrad and graduate economics and business for 16 years. After spending two years at UNU-IAS in Japan, I am now working in forestry research at Scion in New Zealand. I converted in 2004 purchasing a 12-inch PowerBook which I used until 2012, when it finally gave in. I find pleasure in reading, thinking about and discussing science and technology. This entry was posted in Time and tagged BusyCal. Bookmark the permalink. I use Fantastical, another natural language event manager. It also allows you to choose calendars, e.g. “Meet Adam for breakfast next tuesday /admin calendar”. Or was Adam already busy meeting Csaba? As for calendar choice, QuickCal does that, too. You start typing the name of your calendar and it predictively chooses the appropriate calendar.